Android is now the top OS in terms of total internet usage across desktop, laptop, tablet and mobile combined, according to StatCounter with 37.93 percent of the worldwide OS market, just ahead of Windows, which has 37.91 percent. Breaking it down by region, Windows maintained a lead across North America with a 39.5 percent share of the worldwide OS market in March. 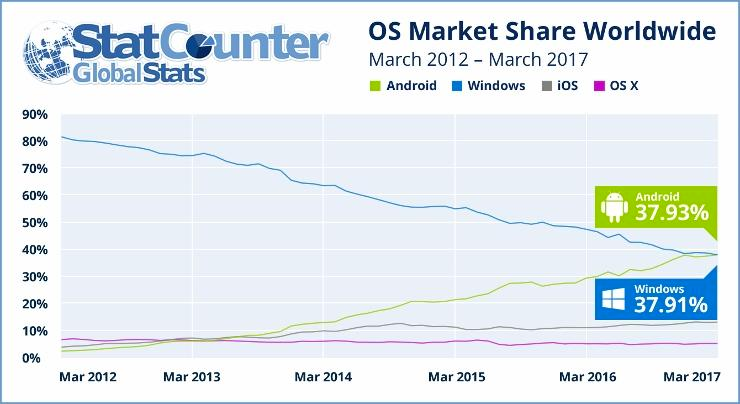 In Europe, Windows has more than twice Android's share: 51.7 percent vs. 23.6 percent. Android won out big in Asia, though, grabbing 52.2 percent compared to 29.2 percent for Windows. "Windows won the desktop war but the battlefield moved on," said Cullen. "It will be difficult for Microsoft to make inroads in mobile but the next paradigm shift might give it the opportunity to regain dominance. That could be in Augmented Reality ... Voice or Continuum." StatCounter collects its data via tracking codes installed on websites that record page views. As The Verge notes, that can make tracking mobile data difficult given the fact that so many people -- particularly those on iOS -- often use apps on their phones more than the mobile web. But it also means Android is gaining in spite of this limitation. Not Promoting From Within? Ignoring Financial Statements? Don't Be Stupid.